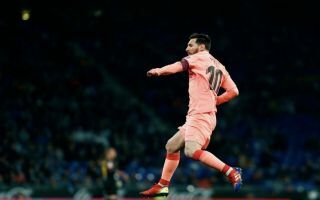 Barcelona captain Lionel Messi was at his sublime best in La Liga on Sunday, as his second defence-splitting pass against Getafe underlined. The Blaugrana secured a 2-1 away win at the weekend to extend their lead at the top of the Spanish top flight to five points, thanks to goals from Luis Suarez and Messi. The Argentine has been widely praised for his performance and for one moment of magic in particular on social media, as he somehow slid a pass through to Suarez in the first half which bypassed the entire Getafe defence. Lionel Messi, just stop it! ? There was a similarly brilliant moment from Messi in the second period, as he picked the ball up on the left-hand side of the pitch before again finding a teammate in the box with an outrageous 30-yard curling pass. The second ball through arguably rivals the one that went viral earlier in the match for pure wizardry and just goes to prove once again that Messi is on another planet when it comes to playing the beautiful game. Check out a clip of the magical moment below, via Twitter.